Once upon a time, there was a little white Aisha named Imiya, who only wanted to sleep. Unfortunately, some rather persistent Babaas insisted on haunting her with math problems in her dreams, and would hit her alarm clock if she didn't answer correctly in time! Now it's your turn to help - answer the Babaas' questions as fast as you can, so that poor Imiya can finally get a good night's sleep! If you don't, that alarm clock is going to ring! You start the game by selecting what types of problems you'd like, and which difficulty level you'd like to play on. The selection you make not only determines which problems you get, but also how many points you get for each one you solve! Each type of problem has a number in front of it. For every question you answer, you'll earn five times that number of points. At the end of the game, your score will be multiplied by the difficulty level -- 1 for Easy Peasy, 2 for Potato Counter, or 3 for Brain Tree. So if you choose Division problems on Potato Counter difficulty (as I did in the below screenshot), you'll earn 5 x 4 = 20 points for each correct answer, and your final score will be multiplied by two. When you start the game, Babaas will begin to show up on the left side, and number problems in little clouds on the right. You'll want to answer them in the order they appear, as they each correspond to one of the Babaas! To do so, you must type the answer into the space at the bottom of the cloud (it isn't necessary to press "enter", if the answer is correct the cloud will disappear automatically). Once the problem has been answered correctly, the Babaa is free to jump over the fence, and continue on its merry way. If a problem isn't answered correctly in time, the Babaa will fall on top of the alarm clock, waking Imiya up and ending the game. Alternatively, the alarm clock can run out completely, which will also set it off. The game is separated into rounds, each of which has nine Babaas with problems for you to solve. In addition, the clock resets at the end of certain rounds - 3, 7, 12, and 17. If you need to reset the clock at a different level (in order to survive! ), you can also do so once per game by using the code letimiyasleep. The best time to use this is generally between levels, when you know you won't make it to the end of the round with the current time left on the clock. This way, you'll get the reset without wasting precious time during a round typing it. 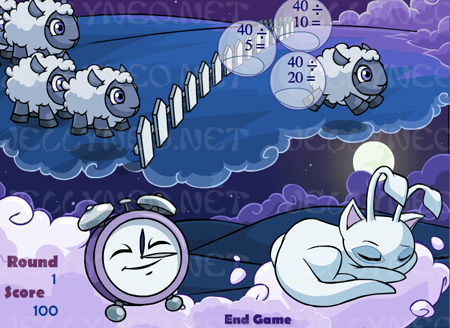 Once per game, you can type in letimiyasleep to reset the alarm clock. If you're aiming for the avatar, you'll need to be on the top 50 when trophies are awarded, so it's best to aim for it early in the month! Play the game with Division problems at Potato Counter difficulty for the easiest problems for the most reward! (This level is not, however, necessarily the best one to use to get the avatar). If you enter an answer that's incorrect, simply press "backspace" to clear it and try again.